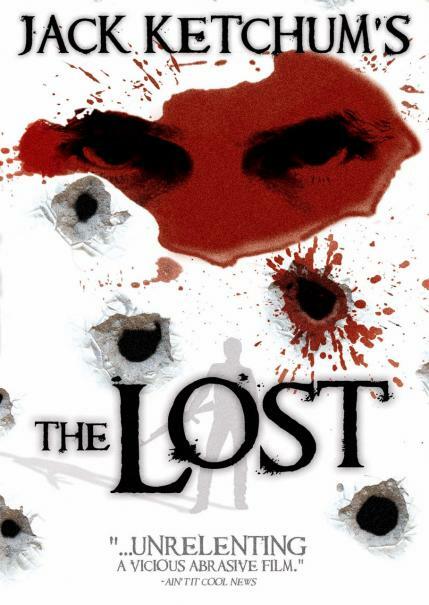 THE LOST: The Serial Killer With A Peter Pan Complex – Schlockmania! If you know the name Chris Sivertson, it’s probably for an unfortunate reason – he was the director of the misbegotten Lindsey Lohan thriller, I Know Who Killed Me. Said opus was awarded multiple Razzies for its confusing plot and the nightlife-addled performance of La Lohan. Simply put, it was the Wrong Movie at the Wrong Time with the Wrong Actress. However, it was an interesting film to look at regardless of what you took from it, mainly because of Sivertson’s flashy, European-styled direction. He got his start collaborating with Lucky McKee (he edited McKee’s acclaimed May) and his style gave some of us the feeling he could do better work with a better vehicle. The Lost is his directing debut, a film shot prior to I Know… – and a more interesting display of his potential as a filmmaker. It has its own flaws to deal with but it also has a power that shows Sivertson to be a very promising filmmaker. 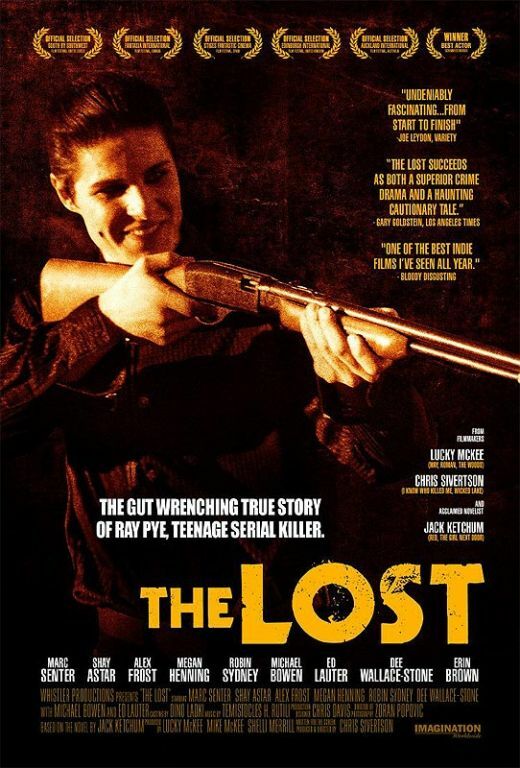 The Lost is based on a novel of the same name by Jack Ketchum (who cameos here as a bartender). It was inspired by a real-life serial killer case – Charles Schmid, the “Pied Piper Of Tuscon” – and tells the tale of Ray Pye (Marc Senter), an overgrown Peter Pan-type hipster who spends his time acting as an elder statesman to the admiring teens of his small town when he’s not managing his mother’s seedy motel. Ray is also a killer – the prologue shows him offing two teens at a campground and then browbeating his two cohorts, sometime girlfriend Jen (Shay Astar) and easily-controlled lackey Tim (Alex Frost), into helping him dispose of the bodies. Flashforward to a few years later. Jen and Tim go with the flow as Ray continues to live his aimless life. However, Detective Charlie Schilling (Michael Bowen) still suspects Ray for the campsite killings and doggedly pursues the case as Ray sets his sights on new conquests. The first is Sally (Megan Henning), a young college-bound girl who is having an affair with a cop (Ed Lauter) a few decades her senior. She quickly rebuffs him but he finds greater luck with Kat (Robin Sydney), a girl with domestic problems who likes to indulge her dark side. Ray’s obsession with Kat – and the pressure applied by Schilling – spark the fuse of his internal time bomb, resulting in a third act where everything goes haywire in a very stark and brutal fashion. The end result has some noticeable rough edges. At two hours, The Lost probably runs about ten minutes too long. The finale is a bit too hurried and chaotic in its choreography to reach the kind of fever-pitch frenzy it is reaching for. Finally, despite giving a very brave performance, Senter is never quite as physically or psychologically threatening as his character should be – and this really hurts the film’s last act. However, said flaws shouldn’t deter cult film types from checking The Lost out. Whatever its flaws, it still packs a hefty punch. Sivertson’s direction is stylish enough to transcend his budgetary limitations, using Zoran Popovic’s sleek, scope-format photography to enhance the production values. He never shies away from the violent or sexual extremes of his material yet he handles them in a way that is explicit without being crassly exploitative. The extremity bolsters the intensity of the story instead of serving as a substitute for intensity – for example, the furious last few seconds cap the film with a psyche-damaging gut-punch that will stay with you long afterwards. Sivertson is also a better director of actors than many of his fellow young horror filmmakers. Adult thesps are used to good effect: Bowen and Lauter delivered nice, lived-in performances as the film’s cop characters and Dee Wallace Stone is genuinely affecting in a brief bit as the haunted mother of one of Ray’s victims. Better yet, Sivertson gets committed, gutsy performances from his younger actors: Sydney is both alluring and affecting as the girl who gets under Ray’s skin while Astar is great as the emotionally abused lover who desperately avoids seeing the truth about Ray. Senter does a nice job of showing the neediness and inferiority complex under Ray’s psychosis. Hopefully, The Lost is a harbinger of better things to come in the future for Sivertson. He survived the chaos of I Know Who Killed Me and is supposedly at work on an adapatation of a novel by Richard Laymon, another heavy-hitter author of cult horror novels. In the meantime, The Lost is a worthy antidote to the all the limp teen-oriented fare dominating the horror marketplace. Previous ArticleTHE FANGO FILES: Issue #03 – Arabian, Shmarabian, Where’s The New Horror?